This was supposed to be my year to Discover 42, but that hasn't been going as well as I'd hoped. I haven't been nearly as motivated to work on it as my 40 Things or Project 41. I still have four more months, so I might finish up some of the activities I'd planned. Or I might not. No pressure, as this is my year to Enjoy. As part of my quest to Enjoy, I have taken back up with a family version of Project 41, which I've nicknamed Project 41+. While the main goal of Project 41 was to connect with a different friend each month over ice cream, this year I've been treating myself to Baskin-Robbins' Flavor of the Month with Steve and/or Trevor. It's been a fun little way to enjoy time with them. I've already mentioned March and April's Project 41+, so I'll start with May. 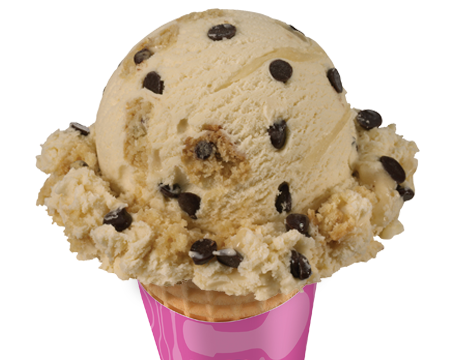 May's Flavor of the Month was called Mom's Makin' Cookies, which featured "brown sugar-flavored ice cream filled with chocolate chip cookie pieces, chocolate-flavored chips, and a delicious cookie dough batter ribbon." Sounds fantastic, right? Sadly, I can only assume it is fantastic. 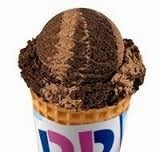 We headed to our local Baskin-Robbins at the beginning of the month to try it, but they were already sold out. Over the next few weeks, we checked every Baskin-Robbins around. They were all sold out. Steve and I even checked the Baskin-Robbins in the Santa Cruz area during our anniversary trip. No Mom's Makin' Cookies to be had anywhere. Very disappointing. When June rolled around and Baskin-Robbins announced Triple Chocolate as the Flavor of the Month, I knew that I wanted to invite our friend Justin to join us so that we could compare Triple Chocolate with the incredibly underwhelming Triple Vanilla that we'd had together a year earlier. Unfortunately, travels, illness, and the usual June insanity of Trevor's birthday, graduations, the county fair, Cub Scout day camp and everything else meant that I didn't try Triple Chocolate. 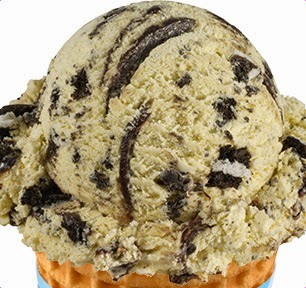 July's Flavor of the Month was Oreo 'N Cake Batter. (Does it drive anyone else crazy when someone spells "And" as 'N with an apostrophe holding the place of the A but not of the D?) By now, I hadn't tried the past two Flavors of the Month and I'd decided Project 41+ was officially over. I didn't make any special effort to make it to Baskin-Robbins. 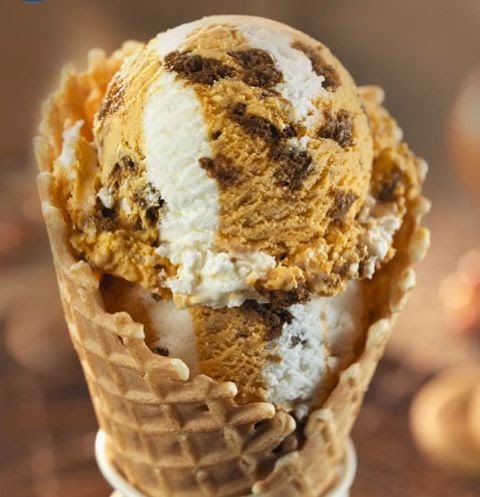 On August 1, Baskin-Robbins announced the return of Oreo Nutty Salted Caramel as the Flavor of the Month. I'd ranked it my favorite from the previous year, so I was definitely interested in having it again. However, medical problems stopped me from making ice cream a priority. On August 2, I blacked out while driving on the freeway and spent much of the rest of the month doing every imaginable test to find out why. After ruling out a brain tumor, epilepsy, and other conditions, I was diagnosed with acephalgic migraines. In other words, I was having severe migraine symptoms without an actual headache. My episodes of total blindness were lasting from 5 to 30 minutes. I would get about 5-10 seconds of wavy lines as a warning that total blindness was coming. Terrifying. I spent most of September doing further tests, working with my doctors to find the correct medications and dosages to help me, freaking out about the possibility of blindness striking me unexpectedly at any minute, and preparing for our epic trip to Canada. Obviously, I'd stopped driving, as blindness and driving are not a good mix. I had no time or interest in the September Flavor of the Month, Pumpkin Cheesecake. I like pumpkin and I like cheesecake, but not necessarily together and not necessarily as ice cream. The month passed by without me giving it a second thought. October was a different story. For years, Trevor and I have gone together to eat October's Trick Oreo Treat. It's become one of our favorite October traditions. I still wasn't driving by then, but a friend took us so that we could enjoy our tradition. By November, my medications were working and I'd gone long enough without an episode that I was confident enough to start driving very short distances. I took Trevor to the Baskin-Robbins 2.9 miles from our house to enjoy First Class Camouflage. It was a major accomplishment. It was delicious. But even better than the ice cream was starting to get my life back again. Baby steps. I'm doing much better now. I'm dealing with side effects from my medicines and I am still very nervous about driving more than about 5 miles, especially in rain or darkness. But the medications are working and I'm very optimistic. A few days ago, Trevor and I headed to Baskin-Robbins for December's Flavor of the Month, York Peppermint Pattie. It was fantastic. It might be my new all-time favorite. I've learned a lot about myself through this whole medical crisis and am continuing to learn more all the time. It's hard to say that anything good came of what might have been the most terrifying experience of my life, but I make it a point to look for the bright side whenever possible. Through this, I've come to better appreciate how wonderful my friends and family are. I've learned how to ask for (and accept) help. I've realized how blessed I am by fantastic doctors, modern medicine, and decent medical insurance. I've gained a greater understanding of what people with health challenges, especially hidden ones, face. I've been reminded that something as small as driving to the ice cream shop and enjoying a cone with your son can be huge. Cindy, that must have been so scary, especially fearing that you might go blind and never knowing when you might temporarily lose your vision. So glad that you found good doctors and that you have insurance - two things I was very grateful for myself this year. Cute post about your adventures at BR! Great pics too.